Posted on 09. Jun, 2011 in Software. Plenty of Peachtree reviews that can be found online prove that this accounting software is considered as one of the best accounting software for small businesses that are available today. Peachtree is created by Sage, which provides the most capable, efficient, and comprehensive all-in-one accounting packages in the market. 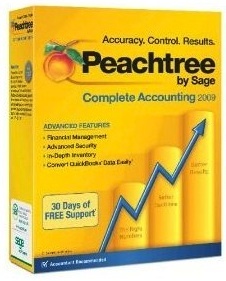 In fact, the Sage Peachtree Complete Accounting often tops most of the accounting software review lists. One of the best features of Sage Peachtree is that it can do almost everything that is needed from an accounting system and even so much more, such as audit trail reporting, tools for managing fixed assets, job cost modules, and PDF and email invoicing. There is a variety of numerous accounting packages and programs in the Sage Peachtree accounting software family. These include the Peachtree First Accounting, Peachtree Pro, Peachtree Premium, Peachtree Quantum, and Peachtree Add-ons. The Peachtree Pro is already sufficient for some small businesses, but as per the Sage software family of Peachtree accounting reviews, many users find the Peachtree Complete Accounting a more comprehensive — and naturally, complete — package. This accounting system is also available in a multi-user version. Let’s take a look at the average ratings from most users of the Peachtree Complete Accounting software in every essential aspect. When it comes to ease of use, this accounting software is not really the easiest to understand and configure. The free accounting software trial version has a handful of sample companies that were already configured, thus, the trial users could easily run reports and do other stuff. However, not every company had the same control panel options. The user has to first configure the features that are required. Those people who just use an accounting software for the first time may find it difficult to set up their company account the way they want with automated payroll, project management, and automatic deposits. Thus, it is really recommend that for first-time users to get help when first setting up this software, which is also applicable to any type of accounting software . Free support is available, which includes a resource center and a comprehensive help section in their software for easy and quick access. Help may also be sought online, as some FAQs, updates, and upgrades, and other basic accounting information may be found through the internet. The accounts receivable section is found in the Customers and Sales module, through which a user can manage customers, add inventory, set sales tax, and calculate finance charges. The users may also deposit funds and perform credits and returns fast and easy. There are 50 pre-defined reports available, thus, users can truly save time by running one of those. The accounts payable section is so efficient and powerful, yet simple. Managing vendors, writing checks, entering bills, voiding checks and processing credits and returns may be done easily. Other functions such as payroll, banking, inventory, time billing, job costing, general ledger, reporting, fixed assets, and conversion and updates are also available and all are rated “excellent” by the users. You can read more reviews and purchase Peachtree software by Sage here.